Background: The efficacy of radiosurgery in cases of surgically high risk symptomatic cavernous malformations (CMs) for reducing haemorrhagic risk and for seizure control has not been clearly documented and the radiation-induced complications of radiosurgery remain problematic. The authors present a retrospective clinical analysis of 22 cases of CMs treated by radiosurgery. Methods: Twenty-two patients with symptomatic CMs were treated by linear accelerator (LINAC) radiosurgery or Gamma knife (GK) between 1995 and 1998. Medical records including radiological investigations were carefully reviewed to the last follow-up. The mean age of the patients was 34.1 years (12–56) and the male to female ratio was 12:10. Twenty patients reported at least one episode of bleeding and four had undergone microsurgery before radiosurgery. The remaining two patients presented with seizure without evidence of recent haemorrhage. In 16 cases, the CMs were deep-seated, and the others were located in the cerebral hemispheres; four were located at an eloquent area. LINAC radiosurgery using computed tomography scan was performed in 11 cases until May 1997, after which GK radiosurgery using magnetic resonance (MR) image was performed in 11 cases. The volume of the lesion ranged from 0.09 cc to 4.8 cc (mean 1.42 cc) and the mean marginal dose was 16.1 Gy (8–24). The median follow-up period after radiosurgery was 38.3 months (21–67). 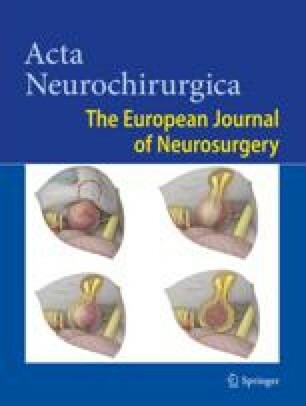 The rate of haemorrhage, seizure, and neurological deterioration following radiosurgery was analyzed, and the rate of haemorrhage was compared to that seen in natural course reports. Findings: There was one case of haemorrhage during the follow-up period and the seizure was well controlled with anticonvulsants. In the group with prior haemorrhage, the bleeding rate of cavernous malformation after radiosurgery (1.55%/year) was lower than that of pre-radiosurgical period (35.5%/year, t=1.296, P=0.04). Six patients showed neurological deterioration following radiosurgery, however, the neurological deficits persisted in only two of the patients with LINAC. The radiosurgical modality (LINAC vs. GK) showed a possible correlation to radiation induced neurological deficits (P=0.06). On the MR images at the last follow-up, the lesion was decreased in eleven patients, increased in one, and no change was found in 10 cases. The T2 weighted MR images revealed a perilesional high signal change in nine patients. This signal change was not statistically related to lesion size (P=0.236), location (P=0.658), nor radiation dose (P=0.363), but was dependent on the treatment modality (P=0.02). New-enhancing lesion and a new cyst were each found in one case, respectively, during the follow-up. Interpretation: Radiosurgery may be a good alternative option for treatment of surgically high risk CMs. However, the optimal radiosurgical technique, dose adjustment, and proper delineation of the mass are prerequisites. Radiosurgery induced complications are still problematic and post-radiosurgery MR image changes need to be further elucidated. Keywords: Cavernous malformation; radiosurgery; LINAC; Gamma knife. Acknowledgment This work was partly supported by grants from the Clinical Research Institute, Seoul National University Hospital. Correspondence: Dong Gyu Kim, M.D., Department of Neurosurgery, Seoul National University College of Medicine, 28 Yongon-dong, Chongno-gu, Seoul 110-744, Korea.